Jumeirah Palm Island luxury villas are seen by their private beaches in Dubai, United Arab Emirates, June 6, 2018. A new report released Tuesday, by the Washington-based Center for Advanced Defense Studies, relying on leaked property data from the city-state, described Dubai’s real-estate market as a haven for money launderers, terror financiers and drug traffickers sanctioned by the U.S. in recent years. The report by the Washington-based Center for Advanced Defense Studies, relying on leaked property data from the city-state, offers evidence to support the long-whispered rumors about Dubai’s real-estate boom. It identifies about $100 million in suspicious purchases of apartments and villas across the city of skyscrapers in the United Arab Emirates, where foreign ownership fuels construction that now outpaces local demand. For its part, the center known by the acronym C4ADS said Dubai has a “high-end luxury real estate market and lax regulatory environment prizing secrecy and anonymity above all else.” That comes as the U.S. warns that Dubai’s economic free zones and trade in gold and diamonds poses a risk. 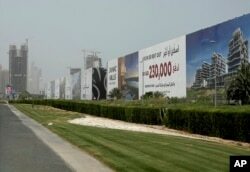 Billboards advertise luxury villas and apartments in Dubai, United Arab Emirates, June 6, 2018. The properties in question include million-dollar villas on the fronds of the man-made Palm Jumeirah archipelago to an apartment in the Burj Khalifa, the world’s tallest building. Others appear to be one-bedroom apartments in more-affordable neighborhoods in Dubai, the UAE’s biggest city. Makhlouf and his brother, also sanctioned by the U.S., own real estate on the Palm Jumeirah, according to the report. They also have ties to two UAE-based free-zone companies. The UAE, a federation of seven sheikhdoms led from oil-rich Abu Dhabi, has opposed Assad in his country’s yearslong war. The UAE also opposes Hezbollah, the Lebanese political party and militia group backed by Iran. However, C4ADS’ report identified at least one property directly linked to Lebanese businessmen Kamel and Issam Amhaz, who the U.S. sanctioned in 2014 for helping Hezbollah “covertly purchase sophisticated electronics” for military drones. The report identified another nearly $70 million in Dubai properties owned by two other shareholders in Amhaz’s sanctioned firms. Separately, the report identified about $21 million in real estate still held by individuals associated with the Altaf Khanani money laundering organization, a Pakistani ring that aided drug traffickers and Islamic extremists like al-Qaida through its currency exchange houses. The report identified Dubai properties owned by Hassein Eduardo Figueroa Gomez, a Mexican national indicted in the U.S. for importing mass quantities of chemicals needed to make methamphetamine. It also identified properties owned by two Iranians previously sanctioned for their work on Iran’s missile program. FILE - The Trump International Golf Club main entrance in Dubai, United Arab Emirates, Dec. 20, 2016. Dubai, an Arabian Peninsula entrepot, long has been a favorite port of call for those skirting the law. Gold smuggling into India served as one of the emirate’s most lucrative trades for the decades after the pearling industry collapsed. Guns, drugs and other illicit cargo also moved through the city-state. Over time, however, Dubai itself became a haven. 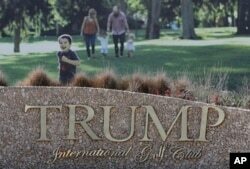 The emirate’s decision in 2002 to allow foreign ownership of so-called “freehold” properties drew a rapid construction boom that attracted developers from across the world, including President Donald Trump, whose name is on two golf course projects and villas. Money quickly flowed in from all corners, especially those now involved in the U.S. wars in Afghanistan and Iraq, likely topping that. From Kabul, the Afghan capital, more than $190 million in physical cash left for Dubai in three months in 2009 on commercial flights, according to an October 2009 U.S. diplomatic cable published by WikiLeaks. In 2008, some $600 million, as well as 100 million euros and 80 million British pounds, made the trip, according to the cable. A banking scandal in Afghanistan in 2010 saw regulators demand that a banker turn over 18 Palm Jumeirah villas and two business properties. The brother of former Afghan President Hamad Karzai also profited from the sale of a Palm Jumeirah villa at the time. In Pakistan, authorities believe citizens invested $8 billion in Dubai’s property market over four years, possibly to evade taxes, officials said in 2017. Alleged Australian drug kingpins arrested in Dubai last year also owned real estate in the city, while the governments of Nigeria and South Africa also have launched investigations into alleged money laundering involving Dubai. Unlike in the U.S., where property records are public, Dubai does not offer an accessible database of all its transactions, instead requiring specific details only individual buyers and sellers would have. C4ADS said it relied in part on “private UAE data compiled by real estate and property professionals” offered by a confidential source for its reporting. The U.S. State Department as recently as this year issued a warning about money laundering in the UAE in its annual International Narcotics Control Strategy Report, noting the country’s money-exchange shops can allow for “bulk cash smuggling.” The UAE’s economic free zones, real estate sector and its trade in gold and diamonds also pose risks.